Home » » Mass poster campaign launched against commemoration of enforced disappearances in Sri Lanka. Mass poster campaign launched against commemoration of enforced disappearances in Sri Lanka. Seeduwa, in the front of the monument for the victims of enforced disappearances. On this day, parents, brothers, sisters, and other relatives and friends of the disappeared person gather at the monument, and several events are held to commemorate the loss of their loved ones. These events include the placing of flowers before the wall where the photographs of over 600 disappeared persons are exhibited. It has always been a very emotional moment when mothers, fathers, relatives, and friends place flowers and say their prayers before the images of their loved ones. Other events held are religious ceremonies conducted by Buddhist, Christian, and Muslim clergy, according to the respective religious traditions of those disappeared. In line with local traditiondhana (alms) are offered to a number of Buddhist monks from nearby temples. Different pieces ofaudio-video footage are shown to remember the tragedy faced by these disappeared persons. Many speakers attend the events to express their solidarity with the families of the disappeared and to support their call for investigations and justice regarding these disappearances. The monument for the disappeared persons was erected in the year 2000. This commemoration event has been held continuously during the last 14 years, receiving considerable coverage in the media. Among the persons who have spoken at this commemoration in the past is incumbent President MahindaRajapaksa, who has supported the event and promised support for demand for justice by the families of the disappeared. Other guests have included many well-known politicians from all spectrums of political life in Sri Lanka, as well as intellectuals and persons committed to the pursuit of human rights in Sri Lanka. Among the guests for this year's commemoration is Victor Ivan a well-known journalist, and an Editor of the highly respected newspaper Ravaya. 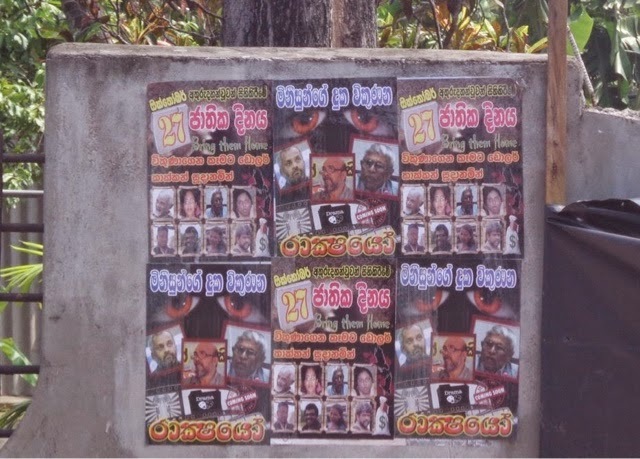 While the event is being advertised, a poster has been exhibited in Negombo, Colombo, and many other parts of the country, attacking the commemoration as a work of "dollar crows". These posters have photographs of Victor Ivan, Brito Fernando (who has been a founder member of the families of the disappeared and a spokesman for this cause), Phillip Dissanayake (also a founder member of the group), and five other persons who have appeared as guests at previous commemorations or have actively supported this commemoration. This poster does not carry the names of those responsible for itscreation and publication. Therefore, under Sri Lanka's law this is an illegal poster. However, the law enforcement authorities have allowed the posters to be exhibited and have not taken any action against persons who are responsible for the publication and pasting of these illegal posters. On behalf of the families of the disappeared persons, complaints have been made to the Inspector General of Police and also to all the nearby police stations, to investigate the matter and provide protection for the holding of this commemoration. The organizers also fear that those responsible for the publication of this illegal poster have done so with the purpose of disrupting the commemoration. They fear that there maybe attempts to disrupt the commemorative activities, which are set to take place throughout the day on 27thOctober 2014, i.e. today. The Asian Human Rights Commission (AHRC) condemns this shameful attempt to discredit and disrupt a commemorative meeting by the families who have suffered due to enforced disappearances of their family members. Under international law, causing of enforced disappearances is a heinous crime. Regarding such disappearances, which have taken place in the South as well as the North and East of the country, it is the government security forces that have been perceived as the perpetrators. The government has publicly undertaken the responsibility of investigating the enforced disappearances and has also appointed various commissions for this purpose. However, it is a secret agency, either directly controlled by the Ministry of Defense or working under its patronage that is likely to have conducted this massive pasting of the posters against those promoting the commemoration on behalf of the families of the disappeared. The AHRC asks everyone to intervene to protect the rights of citizens to express their sympathies and condolences to those who have been unjustly and illegally destroyed by way of enforced disappearances. If, even the basic right to mourn for the loss of their loved ones is attacked, then there can hardly be any space for the protection of the freedom of expression of the people. This attack, by way of publicly exhibiting the posters of those concerned with the plight of their fellow men and women and labeling them as "dollar crows", needs to be condemned as a barbaric attack. Attacking the commemoration of the dead is an attack on civilization itself. While calling upon the government to investigate and take legal action against those responsible for the illegal posters, the AHRC also urges the government to protect this commemorative meeting. The AHRC also wishes to bring this attack to the attention of all international agencies, including all governments, and all of them are urged to intervene at this stage so that such actions will not be repeated and the democratic rights of the people will be respected and protected by the government.